I came across a good deal on green beans from Bountiful Baskets last week and decided to get them even though I’m planting a bunch in my own garden. The last 2 years my beans have been completely eaten by grasshopper so I thought’d I’d at least take advantage of what I could get my hands on. Beans are easy to freeze but they do take a little prep work. Here’s how I do mine up. I start, of course, by washing up my produce. Then I cut the tips off my beans. Before you start, have a boiling stockpot of water ready. Add the beans a few handfuls at a time and boil for 3 minutes. Then remove the beans and put in cold or ice water. This helps keep the beans nice and crispy. Once the beans are cooled I fill up quart sized freezer bags, label, and freeze. That’s it! Find more Canning and Preserving Recipes! My mom used to do this years ago when we had a huge garden. She’d do peas, carrots and beans and we’d live on them all winter long. 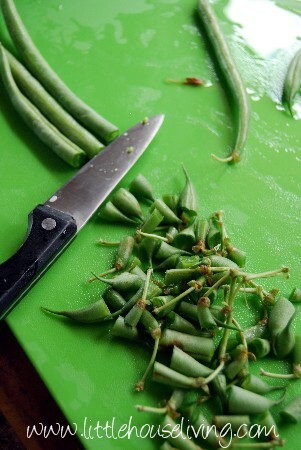 It’s funny I used to hate snapping beans and shelling peas. But now I kinda miss those days. 🙂 I’m going to try my hand at canning beans this year. 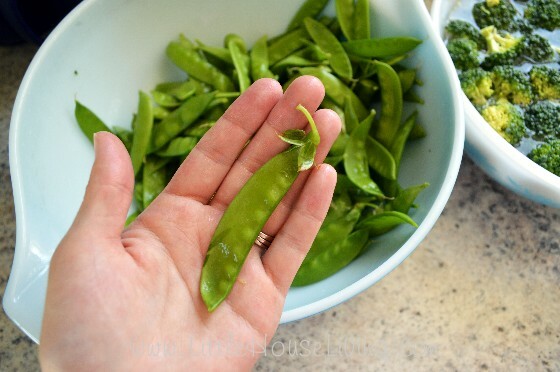 I’m going to do up my peas this way as well in a few weeks and I plan on pressure canning some green beans later in the season as long as I can keep away the hoppers! 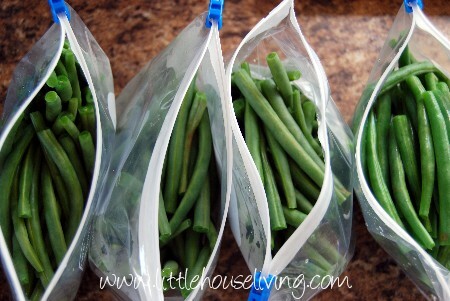 When freezing your veggies like green beans and peas etc…How long do they last in the freezer…? Which is best…pressure canning or freezing…?? I think either method is great. 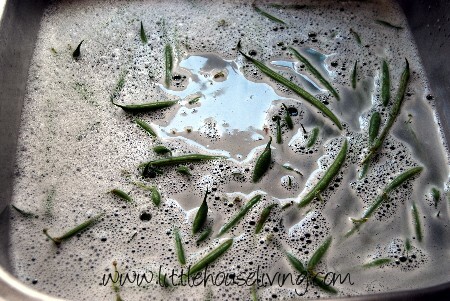 Frozen green beans work really well for soups and canned green beans work great for a quick side dish since they are already cooked. They last about 6 months in the freezer. When I was growing up we had to snap beans and my mother always told us to snap off both ends of the bean. When I got married I noticed my mother-in-law didn’t take off the pointed end of the string bean she said that was part of the bean and it wouldn’t hurt to leave it on. So now I leave it on too and when I pick the beans I take my finger nail and kind of cut the bean off right below the part that is attached to the plant now all I have to do is just snap them saves alot of time. I froze 40 ozs. 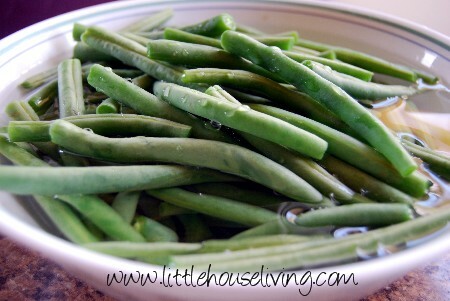 of green beans this morning that I picked fresh from my garden. Really brought back memories helping in the garden and getting things ready to be canned. This is my first garden in 50 years, and I really enjoy it. I did this for the first time a few weeks ago, but must have done something wrong. After you add the beans to the boiling water, the water stops boiling. Are you supposed to wait for it to boil again, THEN start timing 3 minutes? Because I just dropped them in for 3 minutes, and pulled them out….did 10lbs this way…. I tried freezing my fresh green beans last year and they turned out very freezer burnt. When I would try to cook some they would be very hard to seperate. Once cooked, they’d be mushy. Do you have any suggestions of what I did wrong? Do you freeze for one serving or do you freeze more than one serving in a bag? 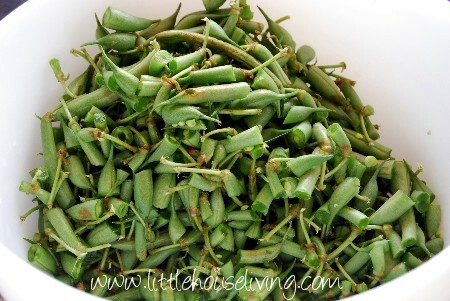 I’m about to harvest my green beans and I don’t want to waste time freezing wrong. Thank you for your help!! They do tend to be a different texture when reheated but shouldn’t be mushy. 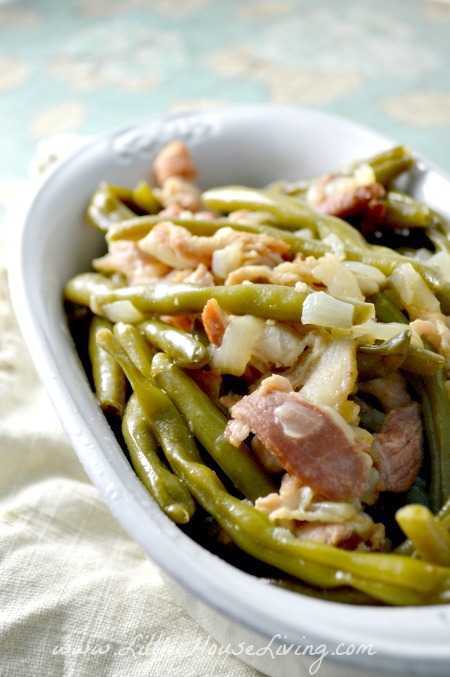 We haven’t found that freezer beans are the best for plain eating but are good in baked dishes or slow cooker meals. I’m not sure why they’d be freezer burnt other than maybe too much water left on the beans before freezing? Make sure to dab them dry before you put them in a bag to freeze them. That will help for them to not get freezer burn. Thank you for this post! I froze all of my green beans last year but for Christmas my wonderful hubby bought me a pressure canner! Yesterday I did the first batch of beans–hopefully there will be many more to come. I was nervous about the pressure canner but it really was pretty easy to use! Have a wonderful week! Last year I had the chance to prep and freeze 5 gallons worth. Hoping my garden gives me 12 gallons worth this year. 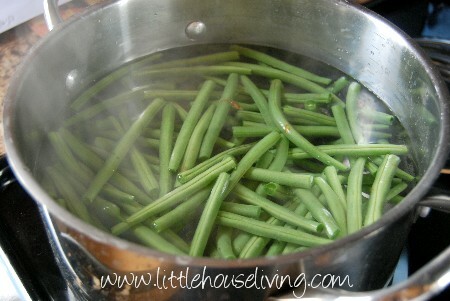 do you pressure can any green beans? If so what is your process? I pack beans in pint jars and pressure can them at 10 pounds of pressure for 20 minutes. What kind of soap did you wash your beans in. The water looks soapy in picture.